This issue brief focuses on (1) the problem with the “traditional” grading system in K-12 schools, (2) the benefits of a standards-based grading philosophy, and (3) the issues with implementing school & district wide grading systems. 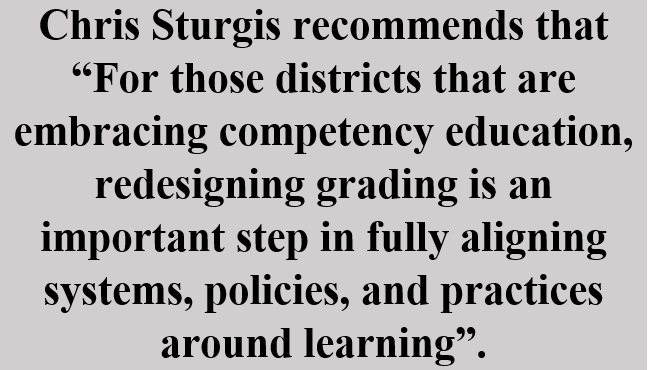 Moving towards a competency-based education paradigm is no easy task, but an essential first step is to adopt a standards-based grading philosophy. Consistency of grading practices, particularly among teachers in the same school, varies considerably. 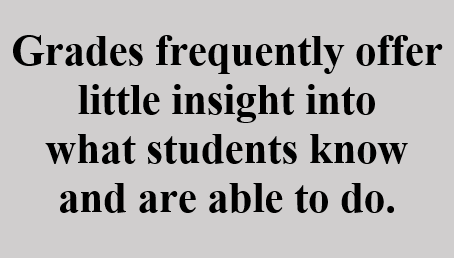 This variability is of concern to administrators, educators, parents, and students.2 Notable assessment researcher Marzano notes that “grades are so imprecise that they are almost meaningless”. 3 Ultimately the current grading system is not a reliable indicator of student achievement.4 Teachers have considerable autonomy with how they grade students and this often leads to grades that can be inconsistent and unfair to students. Due to the nature of the teaching practice, most educators work in their own “silos”, with minimal exposure to collaboration with colleagues. Furthermore, teachers operate with a significant degree of discretion and thus classroom grading practices remain insulated from modification. Richard Elmore states that “Privacy of practice produces isolation; isolation is the enemy of improvement”. 5 Robert Marzano further explains that “It is true that this practice provides individual teachers with a great deal of latitude and freedom. It is also true, however, that American education pays a great price for this latitude and freedom”.6 Because each teacher assesses and reports on student achievement in a variety of ways, grades in many schools are inconsistent and inaccurate. Though most schools and districts have an official grading policy, they are often vague and leave too much room for interpretation. The current system of classroom grading is in need of an overhaul. Standards based grading aims to make classroom grades more valid, reliable and transparent, ultimately providing an accurate reflection of what skills and knowledge students have mastered.7 Though many elementary schools across the country use some version of standards-based grading and reporting, high schools have struggled to transition away from percentage-based grading practices. Despite ample research supporting the philosophy, few schools have actually adopted it. The benefits of standards-based grading are vast and target the underlying issues of the current grading paradigm. Iamarino states that “Standards-based grading takes aim at mediocrity in the classroom and inaccuracies in the gradebook…”.8 More specificity around expected outcomes allows students to actually know the goal of the learning process. The mystery of grading and learning disappears. The premise of standards-based grading centers on learning targets or objectives, which are clearly articulated academic goals.9 Instead of a “hodgepodge” grade, broken down by assignments, tests, and a variety of other factors, teachers report out on specific learning targets.10 Classroom behaviors such as effort, attendance, timeliness are reported out separately as learning habits or habits of work and are usually not included in the overall grade. This provides a more meaningful grade with more transparency around what a student can and cannot do. 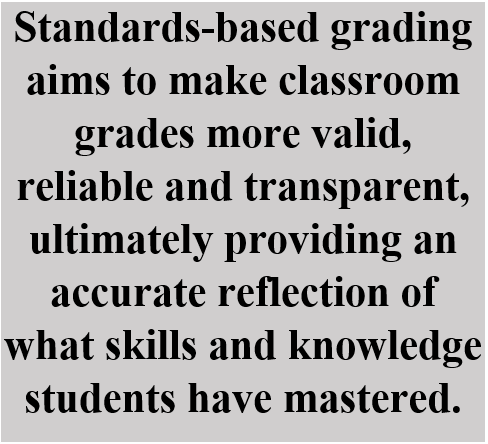 Standards-based grading is more than just a new grading & reporting system. It is major mindset shift around classroom learning and assessment. The philosophy of SBG is predicated on growth mindset around student learning. Time no longer is the factor controlling student progression; meeting proficiency for specified learning outcomes is how achievement is measured. Students can retake assessments, while homework may not even count in the overall grade. Formative assessment and rapid feedback become the means for supporting student growth. In sum, standards-based grading is more than just grading. Any change that attempts to alter the core of teaching practice is difficult to do, as many failed reforms have proven.14 The regularities of school, or as Tyack & Cuban call it, the “grammar of schooling,” have remained relatively unchanged for well over a century, allowing for only peripheral change.15 Changes that confront a general understanding of the “real school”, such as grading practices, attract attention and often quell any reform effort.16 If change is to be brought to scale and sustained, top-down mandates will not suffice; sensitivity to local context and educator needs is a prerequisite for successful translation of policy to practice. The faithful and successful implementation of a standards-based grading policy requires the evaluation of context. Ultimately teachers decide what counts when it comes to policy implementation, therefore it is important to understand how they make sense of demands placed on them. Successful policy implementation requires more than simply understanding or interpreting policy; teachers and school leaders must “make sense” of what is being asked, which is a complicated cognitive process.18 Adopting new ideas and strategies takes more than just absorbing knowledge. Each stakeholder must reconstruct existing knowledge and accommodate the new ideas presented in the proposed policy. Two major outcomes of the sensemaking process exist: assimilation and accommodation. Assimilation assumes teachers take new ideas and make them familiar, essentially keeping things the same. Accommodation may produce the desired effect, because individuals achieve deeper understandings and realize core change.19 Some stakeholders might misunderstand aspects of the policy as familiar and something they are already doing. Although standards-based grading represents a significant paradigm shift, the required conceptual conversion may result in a spectrum of individual interpretations.20 Furthermore, teacher understanding may focus only on superficial features, missing deeper relationships. Successful implementation rests on how stakeholders understand the demands of the policy and how practice is influenced. A variety of interpretations is often beneficial and can sometimes bolster policy implementation efforts, though not always. Policymakers and district leaders should be careful to not be overly prescriptive with policy construction. Datnow finds that a “concept dissemination” approach is more powerful in supporting long-term implementation efforts than are “program dissemination” models.22 A concept dissemination approach focuses on providing principles and frameworks as opposed to scripted implementation rules. Flexibility, adaptability, and sensitivity to local context is a requirement for successful transplantation of reforms. Abandonment and expiry of reforms occur all too often with education change initiatives.23 By allowing for local adaptation, the likelihood of successful implementation increases. High school teachers today continue to employ differential grading practices when assessing student work, with variability occurring between districts, schools and individual teachers within the same school. Many schools in Vermont and the entire United States for that matter, still use the centuries old percentage-based grading system that most of us are only too familiar with. Despite a growing body of literature criticizing “traditional” grading methodology and propounding the efficacy of alternative grading schemes, such as a standards-based model, much remains the same. 26 Classroom grading practices remain insulated from education reforms, despite evidence that indicate numerous flaws in the current system.27 Even though attention on grading has increased dramatically over the last few decades, only a few schools have made any substantive changes to better support research-based assessment practices. There is no one size fits all strategy. Local context is incredibly important as is the need to provide schools with flexibility with the implementation of a grading policy. A standards-based grading and reporting system is a stepping stone towards competency-based education. Despite the inherent challenges of shifting grading practices, the fact remains that the traditional grading system is inadequate. PDF Version of The Rowland Foundation Issue Brief Vol 1, No 1 can be found here. Andrew Jones. 2015 Rowland Fellow from Mt. Abraham in Bristol, Vermont. 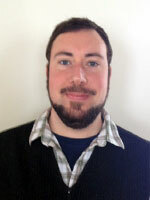 Andrew Jones is a third year doctoral student at the University of Vermont in the education policy and leadership Ed.D. program. He has taught for five years as a 9th grade science teacher at Mt. Abraham Union High School in Bristol Vermont and is currently the science department chair. Along with his colleague Gabe Hamilton, Andrew Jones was awarded a 2015 Rowland Foundation Fellowship to research standards-based grading practices and to implement systemic change at Mount Abe.